I chose to include this card in 2 challenges. The first one is for CAS (Clean and Simple) #80 to use a sketch and ribbon or buttons. The second one is to make a sympathy card which are hard to make for most everyone. I think because you usually want to taylor them to the person you're making them far. But a lot of times it makes it harder to do it that way because you don't have time to "think it through" like you want to. 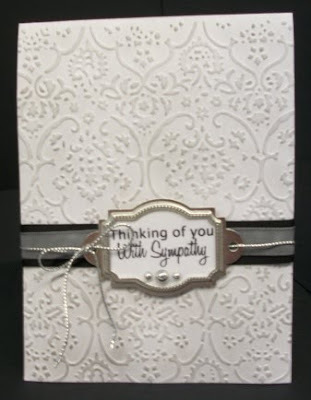 Here is my card for the Cuttlebug Spot Challenge to make a sympathy card. I need to keep some of these on hand. Thanks for the challenge! So very elegant. Can see how opening this card could be soothing and comforting. Very elegant! Thanks for joining us at The Cuttlebug Spot!